Webpage on Management Functions, Human Resource Management, Economic and Social Environment, Accounting and Finance for Managers, Marketing, Management Information System, Quantitative Analysis, Management Economics, Organisational Design Development & Change, Strategic Management, Social Processes and Behavioural issues, Human Resource Development, HR Planning, Managing Change, Wage & Salary Administration, Organisational Dynamics. There are rapid changes in business world. New products are introduced and new alliances are set-up. The companies, which are previously operating locally, are looking for expansion of global markets. There is manifold increase in competition. SAP is a world leader in business software solutions, with industry-specific products for virtually every aspect of operations. 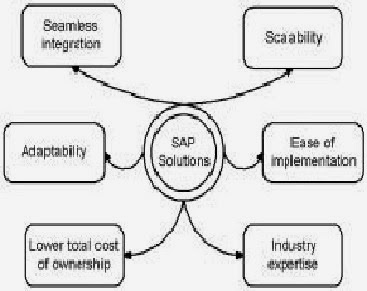 SAP claims that its solutions are built on such technologies that they will integrate with any systems. This is an important property as it enables to preserve your previous investment on it and do not have to major changes while migrating to SAP. SAP offers highly specialized solutions and is the world leader in this category. With installations in 60000 customer locations in 120 countries, SAP is developed and supported by more than 28000 professionals from its global network and this is increasing. Its popularity can be verified from the fact that 19000 organizations worldwide run on SAP. SAP claims that its solutions are designed in such a way so that the businesses get a better return on their technology investment. SAP claims to achieve great results for many companies, large and small e.g. Brother International got a 129% return on its investment on SAP’s Customer Relationship Management program and Volvo Construction Equipment achieved an 89% increase in sales, a 43% reduction in shipping lead times, and a fourfold increase in revenue per employee with the help of SAP’s Supply Chain Management program. SAP’s solutions are available for many industries like aerospace and defense, engineering, construction, and operations, financial service providers, insurance, telecommunications and banking etc. SAP offers a suite that helps businesses to respond more quickly to changing customer needs and market conditions. 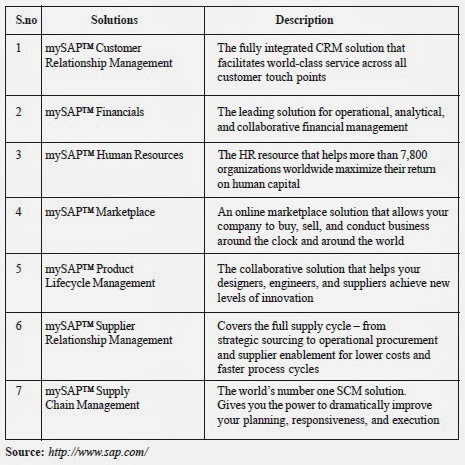 SAP business suite includes CRM, Financials, HR, SRM and SCM and many more. The table given below describes them. SAP claims that since its solutions are based on open technologies they can integrate across technologies and organizations to bring together people, information, and business processes. SAP software comes in two bundles mySAP™ All in One and SAP® Business One. An all-In-One solution helps in management of financials, human resources, supply chain, customer relationships, and other key business processes and is good if you want industry-specific functionality. SAP business one is good if you want to perform your core business functions. Figure-1 show that SAP solutions share common values. They integrate people, systems and thus information. They have the ability to expand the number of users or increase the capabilities of computing solution users without making major changes to the systems or application software. These solutions are capable of responding to changing social, technological, economic and market conditions. These solutions are easy to implement and cost effective if you look at the long-term costs. A lot of real world experience is put into these solutions. Please Give Comments, Subscribe this via RSS or E mail. Become a follower of this site through Google Plus or Blogger.... Feel free to email me at sadhubani@gmail.com for anything. Copyright © Management4all, All rights reserved.